Exploring the unique ways in which the postcolonial and the colonial exist side by side in the West Bank, this article discusses the social and political meaning of traffic lights in Ramallah and Al-Bireh city (R&B), the main urban area under the Palestinian Authority (PA). The arrival of traffic lights signalled an attempt to re-organise the 'organic modernity' of Palestinian streets - and was resisted as such. I knew about this billboard since my university days, I used to pass by it on my way home, but I never took it seriously until I recently bought a car and became an active figure in the traffic flow of the city, it literary says (No to Traffic Jam), with small writings on the side listing the problems the traffic jam leads to, wasting of time, wasting of money, distortion to the city’s image, uncivilised behaviour, pollution, diseases, problems and violence. An image of a traffic jam, a police man in the back scene trying desperately to deal with the situation, and a bad illustration of a crying kid that is strangely missing his nose and mouth pasted on the top of it. 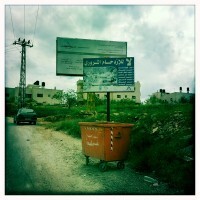 Both municipalities of Ramallah and Al-Bireh collaborated with the UNDP to have it put there. It took me a minute to try to figure out how to react towards this statement. No To Traffic Jam, what does it mean exactly? How am I expected not to jam? How can it be implied? What are the practical measures to such slogan? Doesn’t it sound like a populist political statements such as No to occupation? Or no to poverty? Political statements that never actually found their way to be fulfilled… is Traffic flow political?